Superman fan Gary Robinson wrote a series of articles for the Superman Homepage some time ago, reflecting on his life as a Superman, how his love of the Man of Steel inspired him throughout his childhood and into his adult life. These articles and others have been expanded upon and collected together in Gary's book "Superman on Earth: Reflections of a Fan". 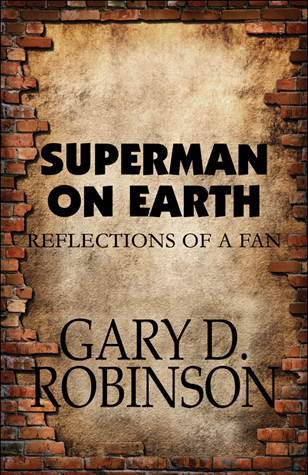 Masterfully written, Gary blends his own life experiences with the history of the Man of Steel in the comics, TV and movies in a way that draws you in and makes you feel like you've taken the journey with him. The book is filled with wonderful stories of life, love, pain, sorrow and joy. While it's Gary's personal life story, it's one that any Superman fan can relate to. Within the pages of "Superman on Earth" I identified with Gary's personal stories of being an adult comic book reader, and of having to deal with comments and criticisms from others about relating to Superman in various real-life situations. "Superman on Earth: Reflections of a Fan" is the story of a little boy who more than anything else in the world wanted to be Superman. Here's how Gary Robinson fulfilled that ambition and what he learned from the experience. From his childhood infatuation through his grown-up forays into fandom, Gary describes life as a man in love with the Man of Steel. You'll meet his family and friends, marvel at his adventures in and out of costume, and see how this "Superman on Earth" lives among ordinary mortals with more earthbound concerns. It's a story of conflict and comedy, pathos and power; ultimately, of self-discovery. It's a glimpse into the heart and mind of a fan. It's also the story of one man's search for personal significance through a cultural icon - a search that begins with Superman but ends... somewhere else. While "Superman on Earth" is one fan's personal story, it's a story we can all identify with, and is therefore well worth a read. At 134 pages it's not long, but it's filled with entertaining stories that will have you smiling as you read.